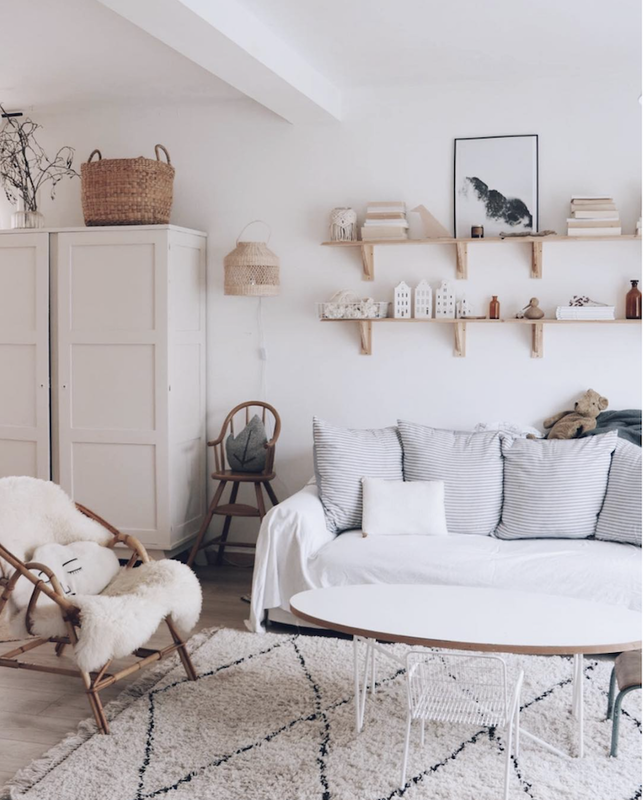 Cosy, warm, natural, très belle - these are just a few words I would use to describe this delightful French home in Manche, Normandy. 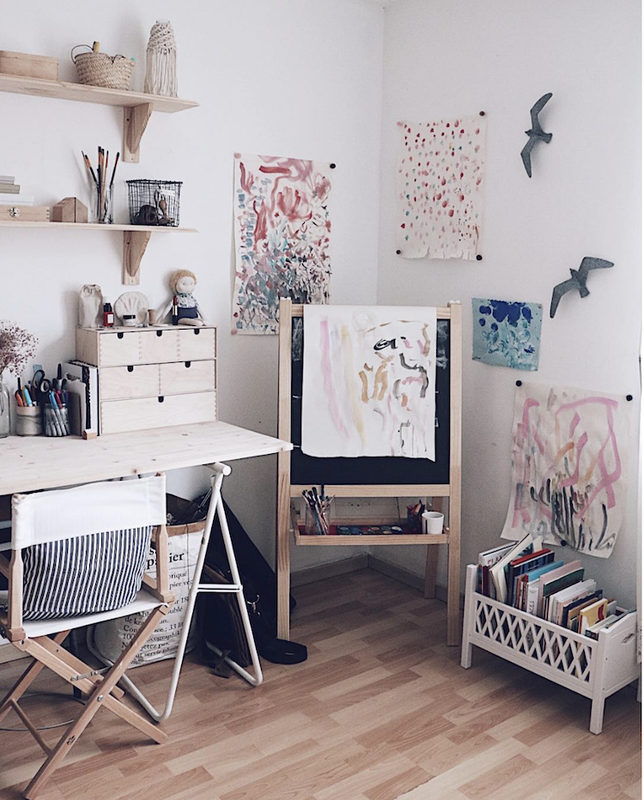 While the interior world is adding colour to the walls one room at a time, Flo of blog J'aurais pu m'appeler Marcel is sticking to her white canvas - and it's a great reminder that white can be family-friendly and warm! Often seen as a Nordic trick of the trade, Flo has added lots of texture to offset the cooler white backdrop. 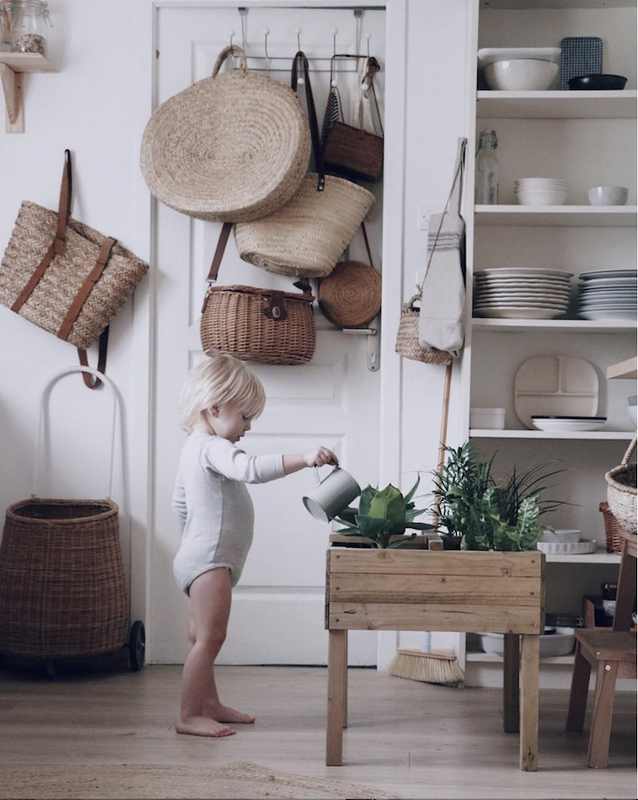 From market bags, wooden furniture, simple sheets thrown over the sofa and fluffy rugs to beautiful vintage pieces that tell a story - it's obvious that the home of Flo, Sieg and their three children Lilou, Gabriel and Jude is here to be lived in and enjoyed! 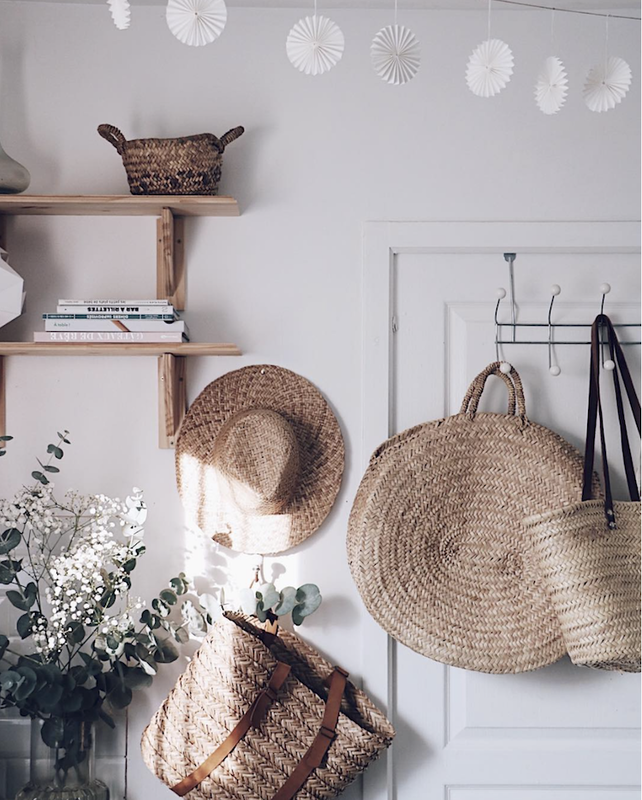 Flo has a basket bag for every occasion and they make a wonderful display in the kitchen. Source a similar array here*. A glass partition creates a divide between the kitchen and sitting room without stemming the flow of light. 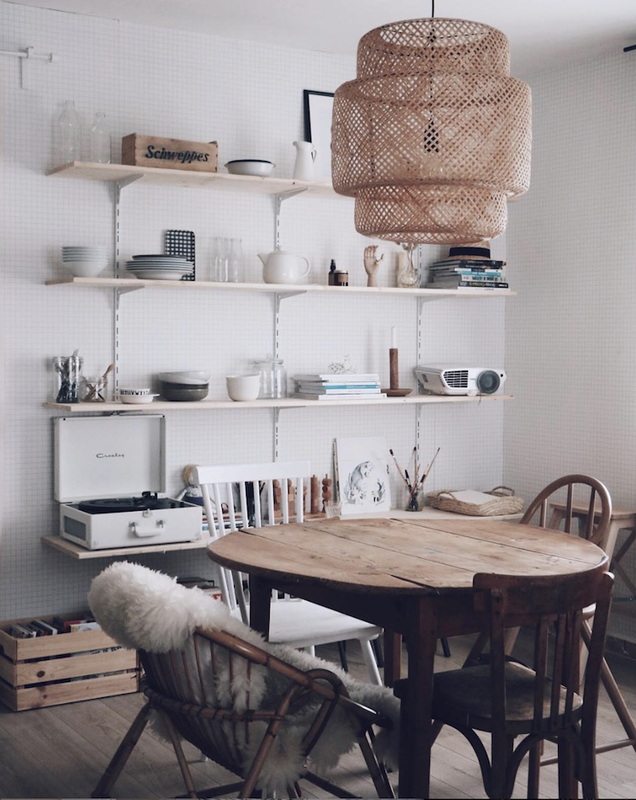 I've been thinking of doing something similar in my kitchen ever since seeing it in Zoé De La Cases beautiful vintage-inspired country home. What do you think? 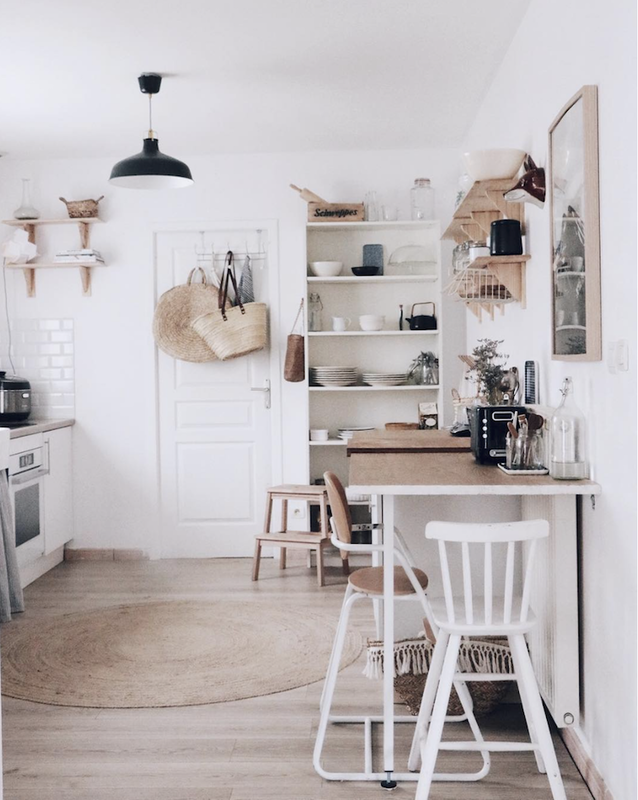 Replacing the cabinet door under the sink with a simple linen curtain* is a great way to add a relaxed, cottage feel to a kitchen and make everything feel that bit softer, while a 'barely there' round jute rug* protects the floor. 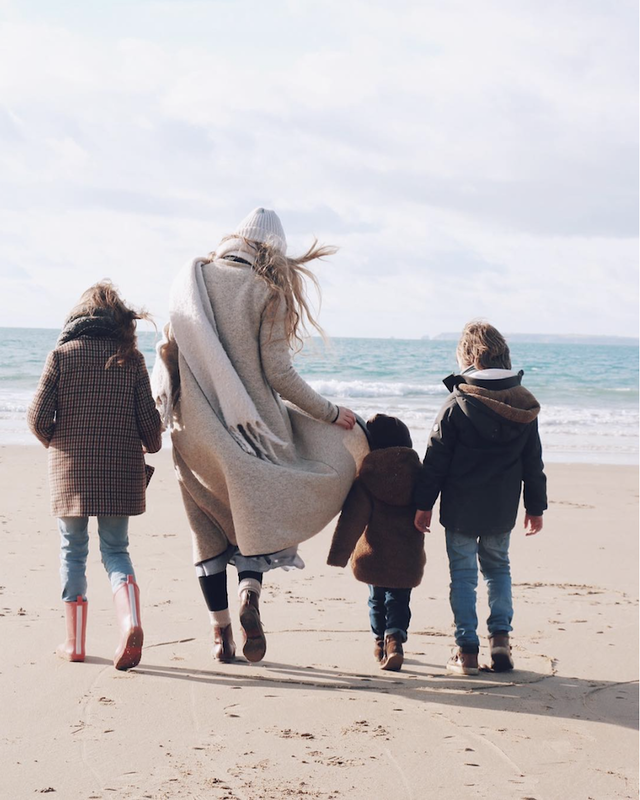 Everyone needs a little alone time in a larger family (trust me, I know!) 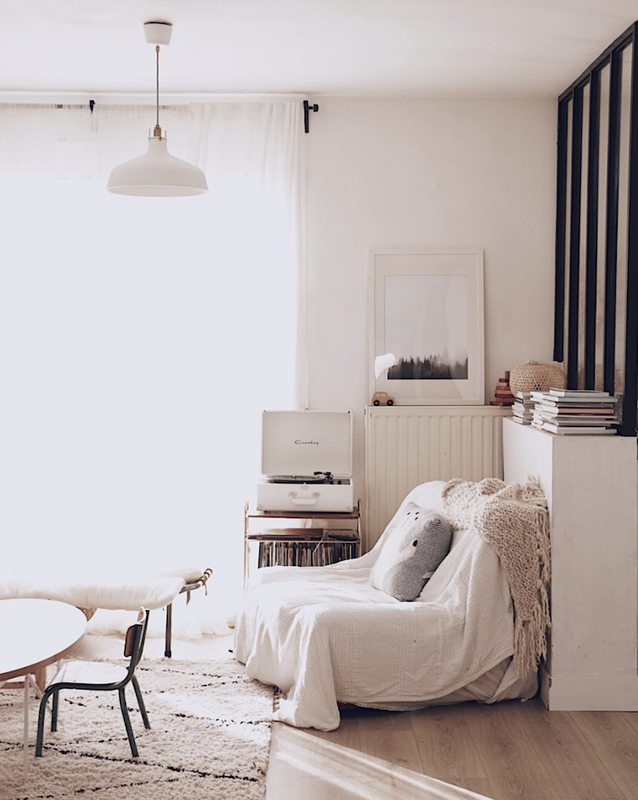 - and this corner seat is ideal for listening to records (on a very cute Crossley player*). I always think kids are a little like cats though - they always seem to get to the cosiest spot in the house first and look so content you can't bare to move them *rolls eyes*!! 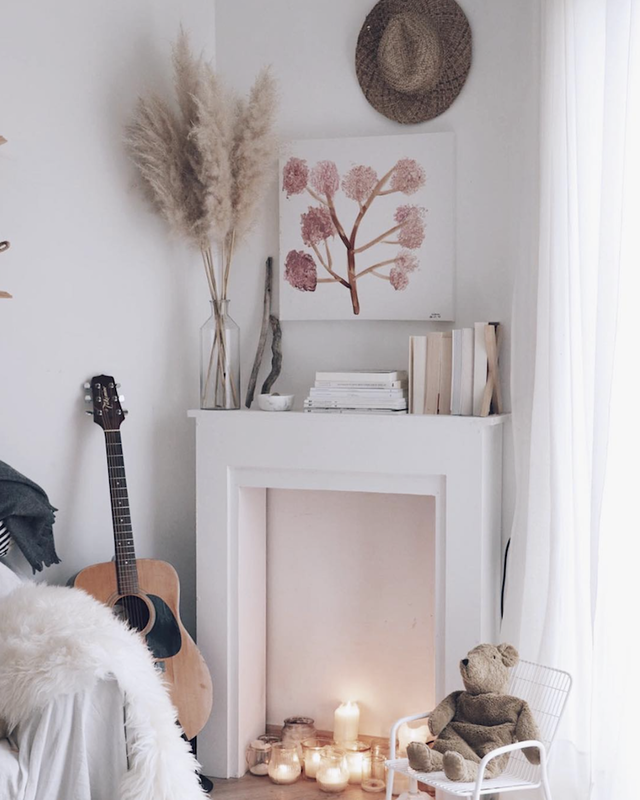 Despite the simple white theme, the sitting room has a super cosy touch thanks to the layers of texture which include a Beni Ourain rug*, sheepskin throw and striped cushions. Jude's room features the only real pop of colour in the house - a half wall painted in a dusty rose (or 'mellinial pink' as it has become known!) and an armoire painted in Farrow & Ball Stone Blue. 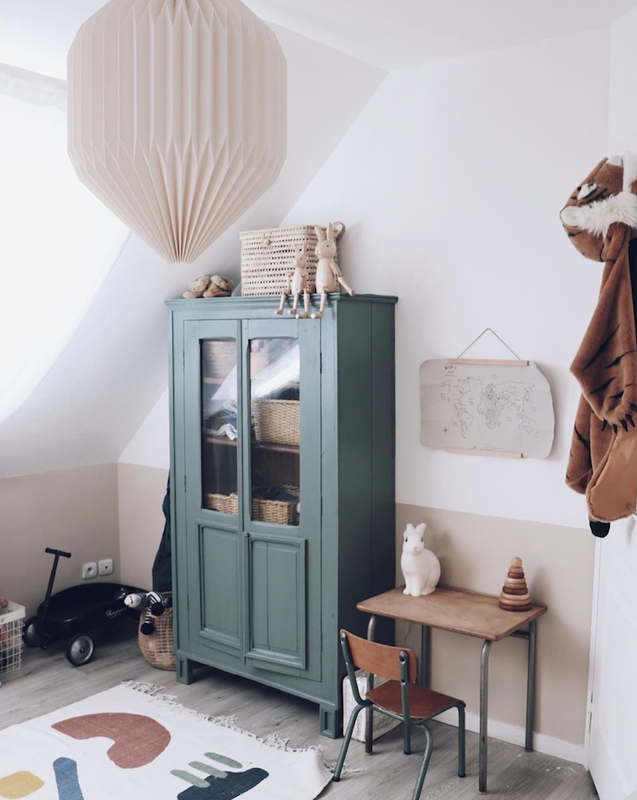 Tip: choose a rug you love (this one is from Monoprix - and I also like this one seen in Olivia's cute bedroom) and then create the room around it, picking out the different accent colours. It's a simple, yet great way to create a cohesive look. The school desk and chair were a vintage find (there's a load of vintage school furniture available here*). 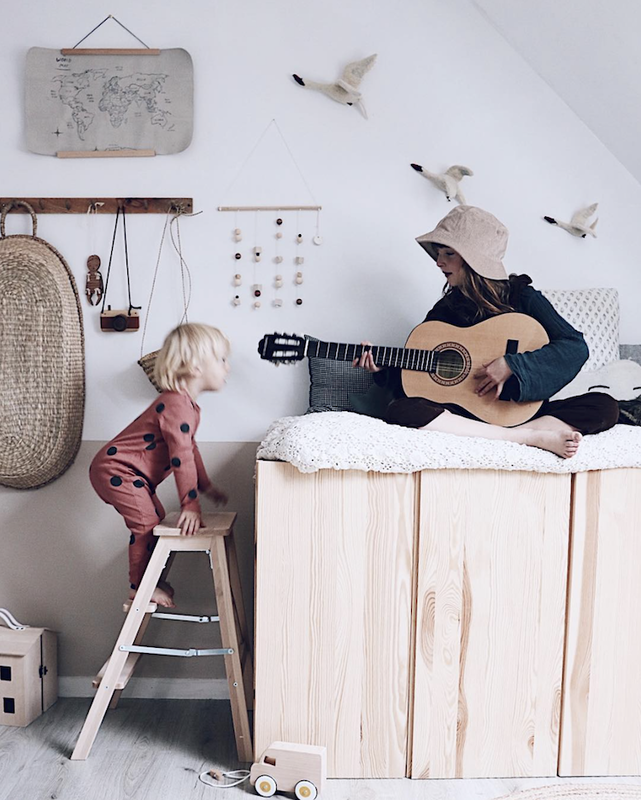 On the opposite side of the room, a ladder leading up to the top of Ivar cabinets creates a cosy place for the kids to sit and play (remember to always nail furniture like this to the wall, just to be on the safe side!). I love the swans (similar also seen in this beautiful home) - I've written a little note to Flo to find out where they're from and will hopefully come back soon! What a delightful home, don't you think? There's something so charming about the relaxed, simplicity of it. Did you come away with the same feeling? See more snapshots of this home on Flo's fab blog and instagram @jauraispumappelermarcel. Oh and more French homes I love (where do I even start with this, there have been so many lately!?) 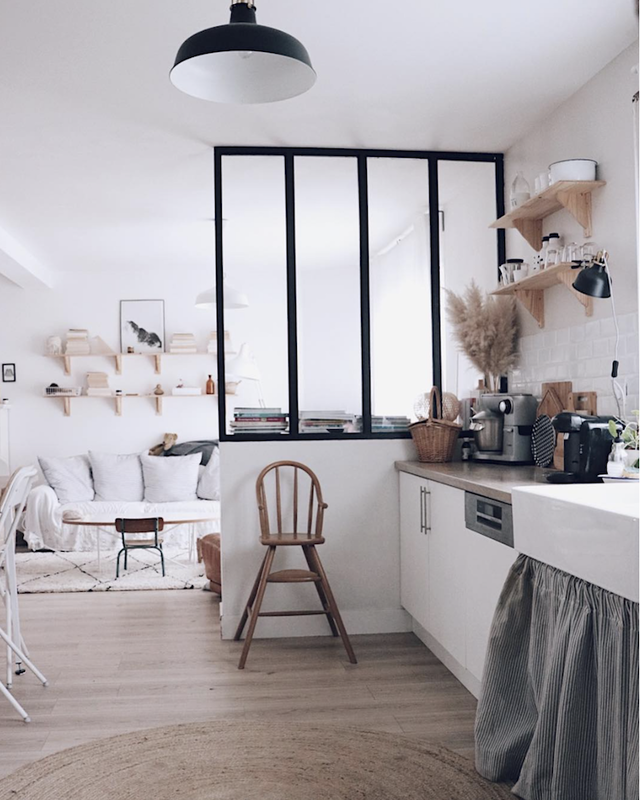 include: the wonderful home of a French stylist, the playful home of a French photographer and a serene home in Normandy, France. Wishing you a happy hump day (yep, the phrase still not doing it for me!!). We call it Lillelørdag - Little Saturday in Norwegian. Much better than hump day! Shows that you are getting closer to the weekend. Same in Sweden - thanks for reminding me, this is SO much better than 'hump day' :) will use from now on! 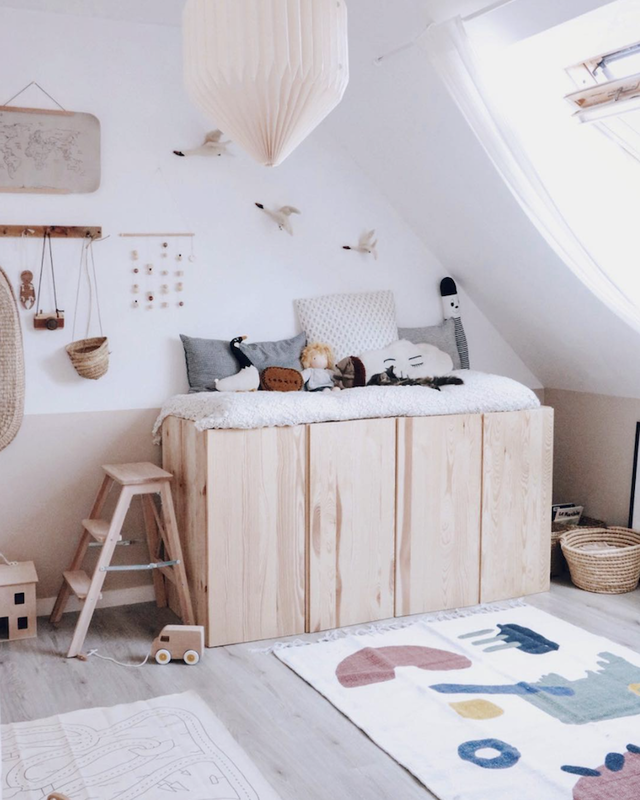 Love the soft palette and natural materials, so stunning! Rustic came to my mind at first, but then I realized it's very soft and cozy. I love the organic approach and the white base overall. I've noticed when I see similar home designs I'm leaning towards light rather than the strong contrasts and bold colors. I just cannot get over at how soothing they are. I am just in love with the entire place. Just getting married in a couple of months and I exactly needed something like this for inspiration. Thanks a lot for sharing this here!